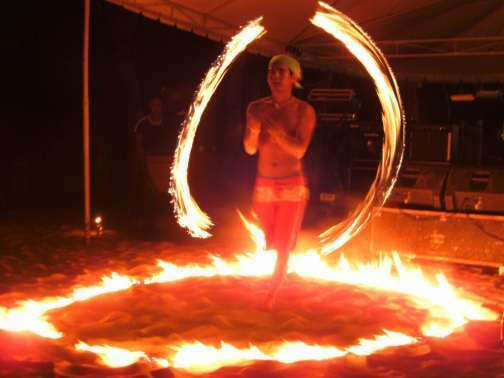 My son Chris recently took a trip to the Philippines with his wife, Liza, who is from there. He was kind enough to share the story of his trip in a guest blog. He sent photos from both that visit and an earlier one. Some of the places in the photos have an ethereal beauty almost bordering on magical. My wife and I spent just under three weeks in the Philippines. The first part of the trip we spent in Anilao with her family. At the end of the trip just the two of us went to Bohol. Both places have great diving, as do many other places around the country. 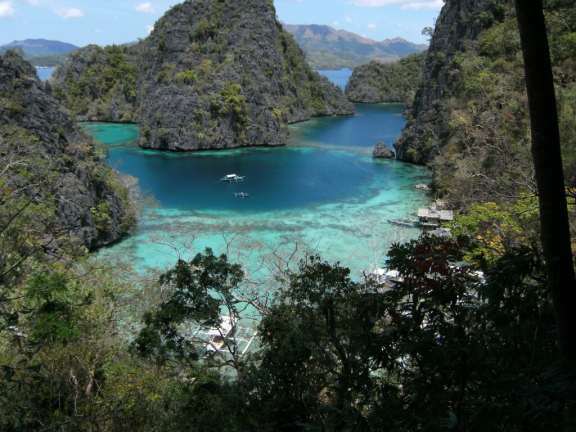 On a previous trip we dove at Boracay and Coron. When we arrived at the Outrigger Resortin Anilao, my wife was immediately upset by the long stairway leading down to the hotel. She worried about her 68-year-old mother going up and down that many stairs. It seems she worried about the wrong person though because it turned out to be her older son who actually got tired walking up all those stairs. We checked in and had lunch in an open restaurant where we ate all our meals during our stay. The food tasted great and the view was even better. 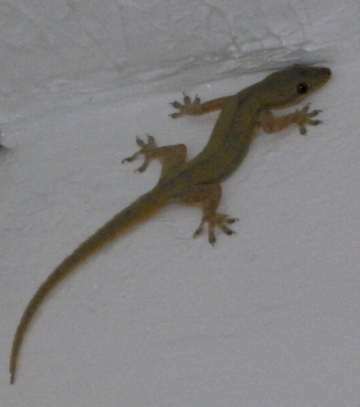 At night small lizards ran around on the roof. A mango tree growing behind the restaurant occasionally dropped a mango on the roof with a loud thump. Our room had plenty of space and was right next to the water. We happened to be there at just the right time for what I believe was a small shrimp spawning time. Every morning enough small shrimp washed up on the beach outside to turn the water pink. By evening they died and turned white. It was interesting to see, but unpleasant to smell. 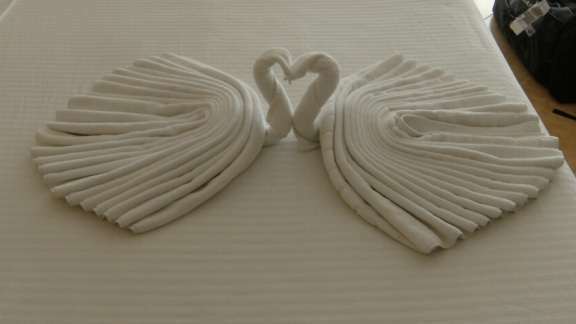 The hotel provided many activities for guests to do including a swimming pool and a pool table. They had kayaks, paddle boats, snorkel and scuba gear for rent and life jackets free to use. 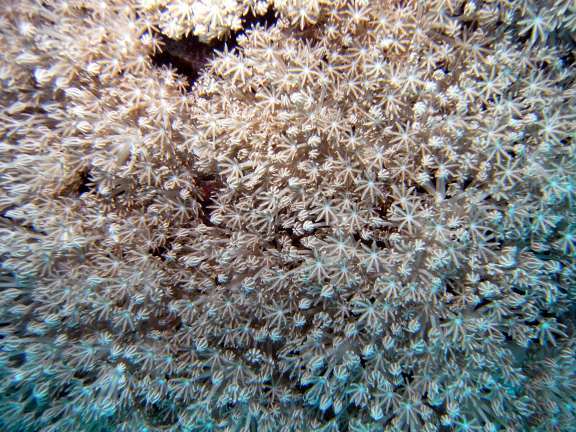 Many small corals made up the most part of the coral just off the rocky beach at the hotel. Some areas of coral had a bit of damage, but still a good variety of life to view and probably the most lion fish of any single area I have ever seen. I did three beach dives there and although not the best diving I did during my trip, it was the cheapest. All the other diving required a boat to get to the dive site. Here I could do beach dives and only needed to hire a guide and a tank. (I always travel with my scuba gear.) It was still much better than the mud holes I dive in at home in Texas. 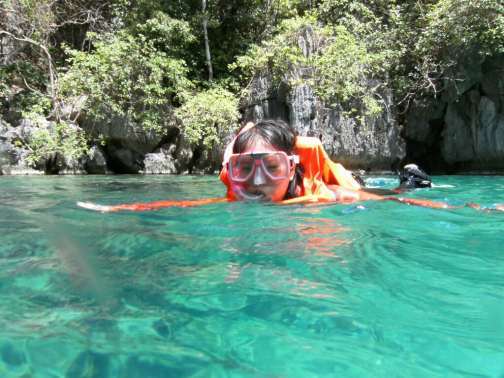 One day we did hire the boat and took all the family to a nearby beach for snorkeling. They feed the fish at this snorkeling site and you can feed the fish too. There were many fish to see but everyone learned the fish are not careful about what they eat and if you have a handful of bread in the water they will bite your hand to get at it. 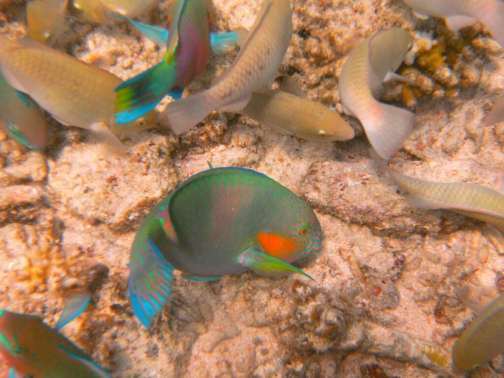 The parrot fish are one of the best looking fish but they had the worst bite. 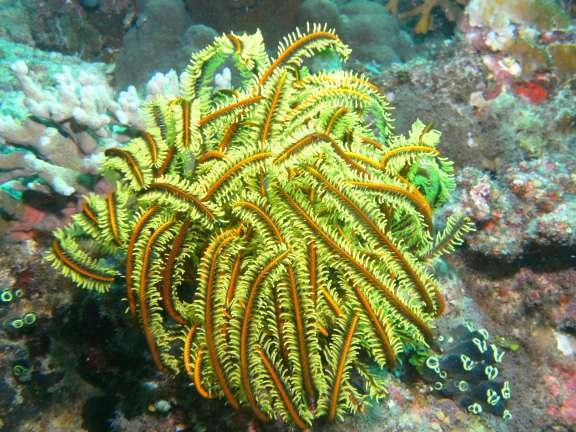 Their natural food is algae that grows on the rocks and coral and they are able to take a bite out of hard coral to get it. No one got seriously hurt but there were a few sore fingers for the people who didn’t keep the bread above the water. I also hired a boat and spit the fee with another person staying in the hotel one day for diving. We did two dives around a nearby small island called Ligpo Island. It’s just big enough for the Ligpo Point hotel that sits on it. 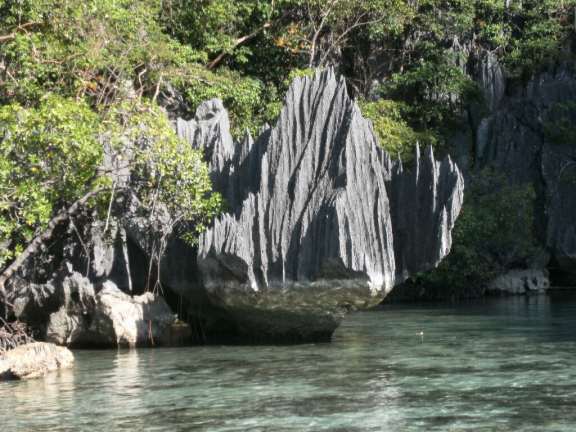 It had some great diving around it with better sea fans then Yapik in Boracay that is known for it’s sea fans and the second dive was on a different side of the island where it was a bit shallower. It had the most soft coral and some of the largest soft corals and barrel sponges I have ever seen. For our last dive we went to the same place we went a few days earlier for snorkeling but just a bit deeper. The area just past snorkeling range had the most giant clams I have ever seen in one place. 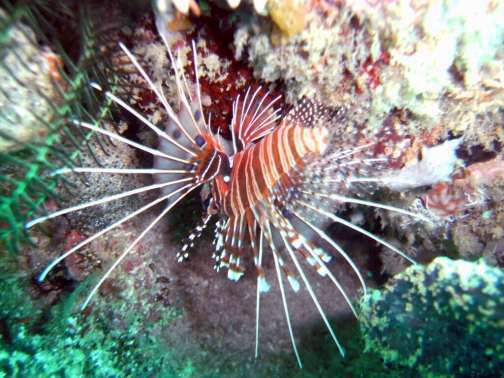 I have seen bigger ones in Australia but there you would see one or two on a dive and in this spot I saw about 30. All to soon our time in Anilao was over though and we took a van back to Manila where we would catch our plane to Bohol. On the way back we stopped for lunch at Gerril’s grill overlooking Mt. Taal. It’s an active volcano that sits inside of a lake that is actually a larger volcano. At the time there were tourist advisories saying that Mt. Taalwas becoming more active no one was allowed on the mountain. As far as I know there hasn’t been an eruption sense our visit though. This entry was posted in Guest Blogs, Uncategorized and tagged diving, Philippines, photos, travel, vacation. Bookmark the permalink. That last picture isn’t under the sea at all. It was taken in a lake in Coron. I can’t remember the name but it was the cleanest lake in the Philippines. They had another interesting and unique lake in the area too called Baracuda lake. 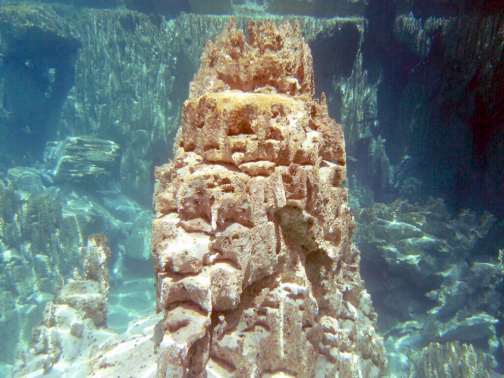 It has a unique thermocline. The water at the surface was in the upper 80’s then at about 20 feet deep the water suddenly changed from fresh to salt and from in the 80’s to 104 degrees. The change was so sudden if you were at the thermocline you could put one arm up and the other down and one would feel cold while the other felt warm. At about 70 feet the tempeture went back down to about 95 degrees. I don’t know what the geological conditions were that caused such a unique thermocline and I don’t know of anywhere else in the world like it. Very interesting. Probably would have been helpful if you had labeled those pictures with what they were. Hey there! This is my first comment here so I just wanted to give a quick shout out and tell you I truly enjoy reading through your blog posts.